There’s no sport. Yes, there are competitions when groups meet up, and certainly some people view these as competitive events where the goal is dominance; but most gatherings are foremost about a technical exchange, so the competition places that technique in practice. More importantly, there’s no you. Unlike the vairous governing bodies like the Kung Fu council and FIE there isn’t a single governing body for HEMA. That hasn’t stopped some people from trying to impose one, but in the end groups like HEMAC and BFHS are groups of affiliated but diverse interest groups. Fear level, and Stress level. Unsurprisingly the perception of risk, stress and fear levels are lower in agonistic conflict, where the intent is not to cause lasting harm because you want everyone to come back to the next class. And it would seem that our end-of-class sparring or assaulting fits the model of competitive combat. So, why not call that “sport”? The problem with that term is it fixates on the wrong goal. Modern three-weapon fencing, whilst being great for fitness and form is a country mile away from defensive arts practiced in the long 18th century. 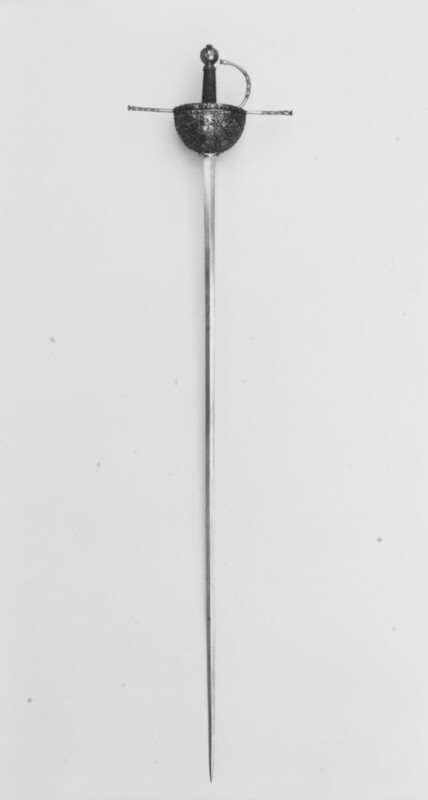 It is a sport because it’s goal oriented; and the fact is, two fencers may contre-temps with one another and exchange what would be fatal thrusts, and one side will still be awarded a point on quite arbitrary grounds (because they straightened their arm first and had priority). Fixation on winning points leads to thuggery, especially in the inexperienced. And artless thuggery benefits greatly from physical advantage (through brawling, intimidating behaviour, etc.). And while you can train someone in art well enough to overcome the thugs, a new student with promise may well be put off and quit long before they achieve those lessons, because all they see are artless thugs intent on dominating and winning, with no intent on improving their actual skill. It should be clear why this problem can exist in the first place: there is no threat, no perception of risk, and this modifies behaviour. 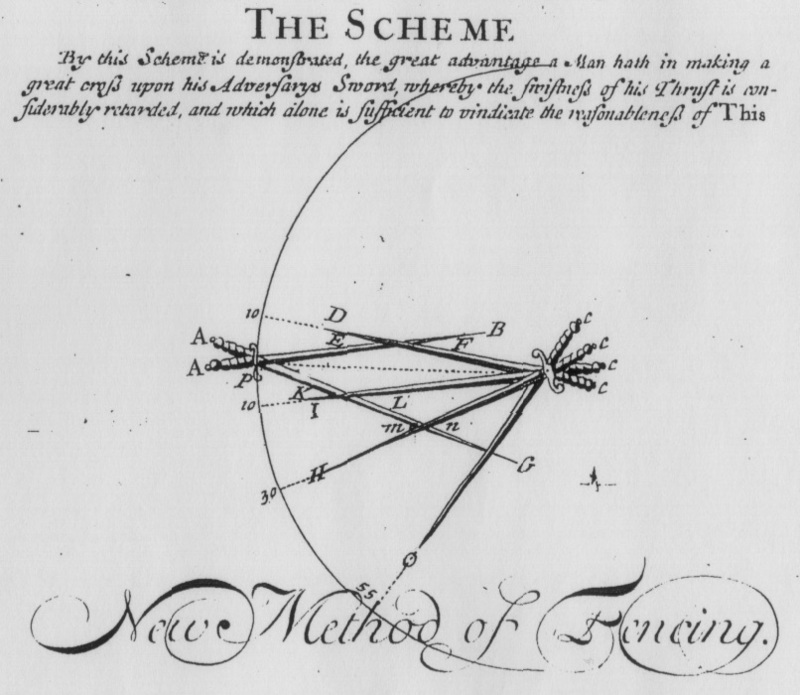 Hope was well aware of the difference between salle-play (agonistic) and a lethal attack at sharps (antagonistic) and how it modified behaviour, and he prepared his students thus — fancy tricks for the salle, but keep it simple and stick to what you know in a fight for your life, and think to your own defence first. The modern fencing salle should be a safe place to train in, so factors of fear (and to an extent, stress) are massively diminished. Instead we have other ways to modify behaviour in combat. Free-play is collaborative rather than competitive, so more like Theatrical exchange; and for assaulting, changing the conditions of victory massively changes behaviour away from thuggery towards art (for example, only allowing scoring off the riposte). I despise the word sport in conjunction with martial arts, because it legitimises winning as a be-all and end-all; and this leads to a callous, sink-or-swim culture, normalised in a particular demographic. Ours isn’t a sport, it’s a science. 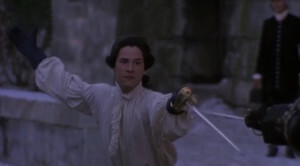 “Dangerous Liaisons” (1988): Duel Scene and de Tourvel’s Death from August Martin on Vimeo. 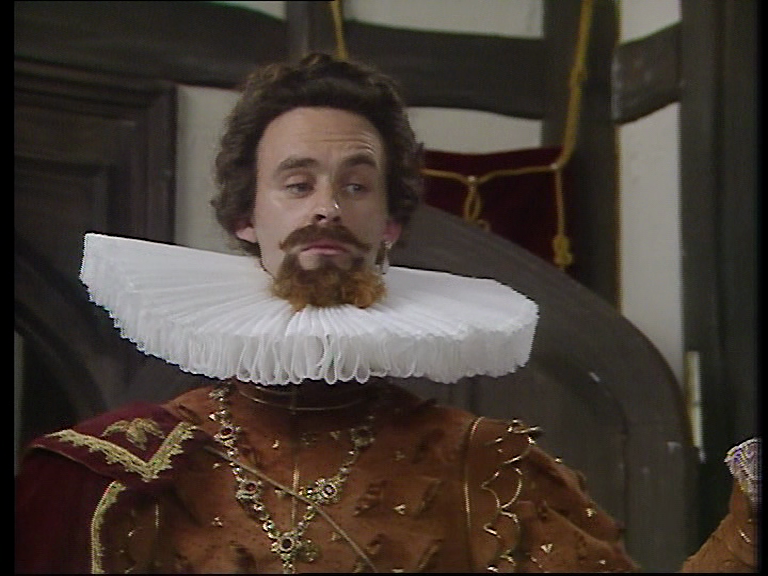 The Vicomte at least turns up to the fight sober, unlike this scene from 1989’s Valmont. 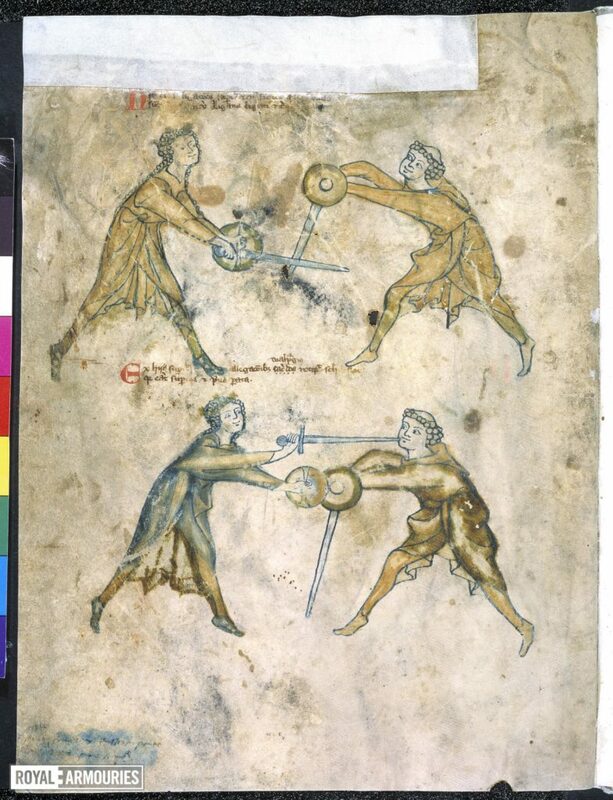 In both versions Valmont and Danceny are probably evenly matched, Valmont having more experience but the Chevalier having youth, vigor and a lot of technical skill (as shown in Danceny’s bout with Gercourt in Valmont at about 1h00). What’s interesting is how the positions are reversed between the films. 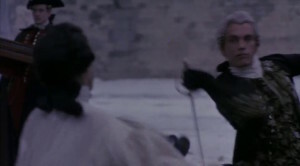 Reeves’ Danceny attacks with uncontrolled and dogmatic fury while Malkovich’s Valmont has a calm and irritable aloofness. But in Valmont, Colin Firth’s character is the one to initiate the exchange, forward and angry while Henry Thomas’ Chevalier remains calm throughout, always giving ground until Valmont’s fury is spent before delivering a single, fatal thrust (we assume, as this happens off-camera). 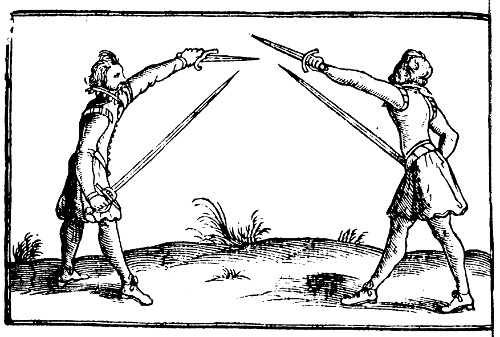 in Central Europe the First Blood principle was held in low esteem — which meant a debilitating injury was required to terminate the duel. What’s going through these characters’ minds? Valmont does not want to kill Danceny. He has control of the fight throughout — he chooses when to retreat and when to advance, displaying great calmness, vigor and judgement, sparing Danceny when he could kill or wound him, non-verbally halting the duel to change swords, ignoring his opponent even when on his knees, and ultimately choosing to die. To him the whole affair is a tragic waste of time. But, did he intend to die from the outset? 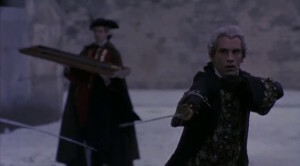 It would seem so given that he is carrying around Merteuil’s letters, and he is psychologically hamstrung by the fallout from his affair with Tourvel; but it’s uncertain whether he decides to die out of despair, or because he must be punished, or just as an alternative to inevitably killing Danceny. Danceny doesn’t know what he wants. All he knows is that he is unable to concede, and he lets this drive him throughout the exchange to one end or another. After his temper has cooled Capaldi’s Azolan tells him “it’s all very well for you to feel sorry now”. While this seems a bit harsh given all we know of Valmont’s mind, still Danceny is an immature character who didn’t realise the stakes until too late. Steinmetz notes in The Romance of Duelling “he who makes free with the bottle seldom rises with a steady hand”. Valmont’s judgement is fatally clouded by drink. This Valmont is every bit as aggrieved as Danceny; while we can put his drinking the previous night down to fatalism, at the point of the duel he is practically enraged. Was there time enough for Valmont to think? Consciously or not, in the end he forces the same decision onto the Chevalier that Malkovich makes for Reeves. Danceny would have been satisfied by an apology, and probably first blood if the opportunity had arisen. 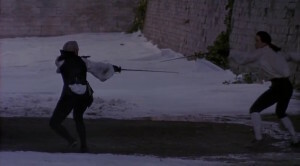 The earlier bout with Gercourt shows exactly how much control the Chevalier has with the sword; but the fury of Valmont’s advance probably left him with little option. Probably. After all, the Chevalier doesn’t seem too cut up at Cecile’s wedding to Gercourt. Perhaps he’s a sociopath after all. Plus, we know he could probably have Gercourt on a good day. Watch Dangerous Liaisons II: Doubly Dangerous and see Cecile and Danceny conspire to arrange a duel, dispense with Gercourt and live happily ever after. by Smiorgan Comments Off on Martial Truths: Can Art Overcome Strength? This is sort of an addendum to the female-only tournament discussion — however I didn’t want it to overshadow the main point in that post which is if you want more diversity in WMA, safe spaces for minorities can help because they address feelings of inclusivity, self-esteem, etc. That goes double for instructors who are female, persons of colour, trans, etc. Anyway… in the female-only tournament debate the “Art vs. Strength” discussion has been used a few times. The WMA canon is in love with the idea that Art will always overcome Strength. Strength certainly much less important than Art — as this recent article by Claire Ryan argues. Whether people of widely different size, strength etc. should train and bout together. our tournaments are not segregated in any way. If you are smaller or weaker, or taller, or stronger, you are expected to deal with it as best you can and learn from the experience. That’s it. Weapons do not discriminate and neither should we. But what is strength, and is it an advantage? Part of the problem is what we mean by “strength” and the way it’s conflated with other attributes like being physically big. Strength is context dependent: a dancer is strong, a rock-climber is strong, a long-jumper is strong. I have given first place in the list to Strength, not because it is superior to Art, but because it is impossible to display Art in a proper manner without Strength. Of course the context of boxing is not the same as for fencing. Still, developing the correct strength matters, and more strength never hurts — as long as it isn’t a crutch for poor practice. Because when it is strong against strong, the stronger one will always win. 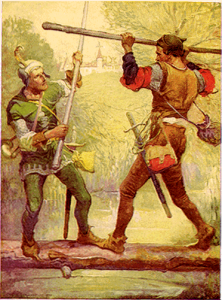 That is why Liechtenauer’s swordsmanship is a true art that the weaker wins more easily by use of his art than the stronger by using his strength. Otherwise what use would the art be? However I don’t think this is what Liechtenauer means. This is not an absolute, art-trumps-strength argument — it’s just a vindication of the science of defence that it can be used to succeed where there’s a deficit of strength. Silver talks at length about how the “tall man hath the vantage against men of mean stature” in cap. 45 of his Paradoxes of Defence. The advantage of the taller man is only preserved if their fight is perfect. If the man of mean stature has a perfect fight and the taller man is imperfect, all bets are off. The defender (“patient agent”) may still preserve their life by virtue of their true actions in defence being faster to execute than the motions needed for the Tall Man to come to the Place. Or as an instructor once told us, “your first step back will be faster than their first step forward”. When the “man of mean stature” wishes to offend their taller adversary they are always obliged to “come guarded under his wards” in offence. The sub-text of the last point is this: while coming in may present a risk for a smaller agent against taller one, there are strategies and techniques which may be developed to mitigate those risks. Again, art may be devised to overcome strength (just as tactics may be employed to overcome a disadvantage, &c). This is what a decent coach does. They recognise the strengths and weaknesses of their students, train out the weaknesses that can be trained out and offer alternative ways to overcome those that cannot. If, for example, the student cannot resist the furious battery of their huge opponent on their weapon, the instructor can offer alternatives involving slipping, traversing, or even stop-hits (in the case of egregious false times from large opponents). I’m not keen on examples such as Inigo Montoya vs The Mountain that proclaim victory for Inigo every time (q.v. Claire Ryan’s article). Not because I don’t want Inigo to win (as is right), and not because they’re implausible, but because they require very specific circumstances to be true. The Mountain is almost certainly as accomplished an artist as Inigo, and Inigo will lose if he plays the game according to The Mountain’s rules. But then part of Inigo’s expertise comes from knowing how not to play the opponent’s game. What a student needs to learn is how to create those circumstances where they have advantage and minimise disadvantage, and that’s what a true art does. But the “art” isn’t just blade action, swiftness of feet or accuracy; it’s tactical reasoning and judgement. These things may be trained, regardless of size and strength. And to be honest this is where a diversity of instructors benefits everyone, because we’re not reliant on a particular body type or mindset to accomplish the art as written by our forebears. So, I attended the Diversity in LARP panel at Nine Worlds, and it was great. After the panel I started thinking about diversity and inclusiveness in Western Martial Arts (cross-fertilisation of geek streams is one of many great things about Nine Worlds). How are we really doing in being inclusive, respectful and sensitive to students in WMA? Maybe not so well. By coincidence, a discussion on the value of women-only tournaments in WMA (aka HEMA) has been doing the rounds recently. 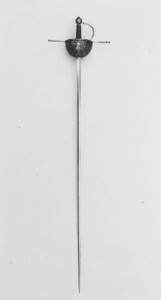 Guy Windsor’s post Swords do not discriminate. Neither should swordsmen. (sic) was written after one of his own students was denied entry to a women’s tournament in the USA. That incident was also covered by Devon Boorman of Academie Duello. Devon’s article runs through the arguments for and against women-only tournaments, but at the same time he’s also fully aware he’s a white dude with all the bias and blind spots that come along with that. I should say at this point that my examples are about gender diversity. I am sure the same comments apply re: safe spaces for persons of colour, and particularly diversity of instructors as visible champions of HEMA. I don’t see it as a physiological needs kind of separation, which is why any sort of trans discrimination is ridiculous. It’s primarily cultural and psychological, and ultimately comes down to a quasi-marketing scheme to get more women invested and involved in these events. There are opponents — like “Herbert” in this Schola Forum thread that responds to Devon’s article. Herbert’s position is that weapons are a great equaliser, women and men are treated with equal respect in training, and there is no imbalance between men and women in our community or in the west in general (because he hasn’t seen any evidence of it…). I’m absolutely certain Herbert means well. But Herbert, like Devon, like Guy and like myself, is a white bloke. And it’s counter-intuitive to say that a segregated space can lead to better inclusion, because we don’t value those spaces in the same way. “How about small men? Or gay men? Or any other group that feels they are affected by a social power imbalance? We can’t give everyone a special event!” Why not? If our goal is to be inclusive and expand the practice of our arts in the world (certainly my goal) any group that can support a tournament in numbers should certainly be welcome to have one if they feel it will better include that group. More groups and more people would only benefit all of us. The school is open to anyone who is serious about wanting to train. All students get the full support of the instructors and fellow students, with as much encouragement and time as they need to develop their skills. Students should feel safe and welcome in the training environment. What is it to feel “safe and welcome”? I’m not sure, because I don’t think I know what it’s like to feel unwelcome. I fit the image of a martial artist pretty well (tall, strong, male — I even have a shaved head). I’ve never really been other in that environment. I always hope that this is a non-issue for our schools — like Herbert, I imagine an ideal world where every student is treated equally, there is no gender imbalance, everyone is accepting of how a person identifies themselves, etc. But I’m sad to say I have personally witnessed bias and even transphobia (and I’m embarrassed to say I didn’t call it out as vocally as I should have). And for me it’s only been a couple of times — so it’s highly likely that most of the cases of e.g. sexism are invisible to me, being in the majority. This article by the Black Boar Swordsmanship School tackles “shame” in the fencing salle. Really it’s talking about feelings of self-worth, and how people react when their self-esteem is challenged by failure. Of course this is a general case for all students; but building self-esteem and confidence is a big part of training. The low point of a student’s self-esteem will probably happen at the “conscious incompetence” phase of their training (discussed here). If they can’t get over that “difficult minimum” they may well quit. Managing these negative feelings (I hesitate to call it “shame” in this context) requires the instructor to have a dialogue with the student — recognising the source of the issue, helping them accept it, and supporting their moments of self-doubt. So, if there’s value in a female-only training space, it’s this: managing the early periods where a student is pushing through that early stage of learning where their self-esteem is so important. This is the main reason for a female-only “safe space”. It goes without saying that to develop these spaces, the best way is to have more female instructors. We don’t have enough of those; but I’m sure we can do better by raising the profile of women by asking them to present classes and seminars, etc. And I guess one reason we don’t have more female instructors is because training environments don’t support their development. If you’re a big strong bloke in a “sink or swim” type martial arts environment that doesn’t manage these crises of self-worth, you can build your self-esteem by winning fights because you’re strong. As a result you need less support when you hit that minimum, you can push through and maybe even become an instructor yourself (and you can visualise yourself as an instructor — because a lot of instructors look like you). It’s possible this article will provoke a negative response from some male instructors. All I can say is… dude, it’s not about you. It doesn’t mean you’re not doing the best you can to be sensitive to your students’ needs. But sometimes, doing the best thing means stepping aside and letting someone else lead. Let’s talk about martial arts schools. 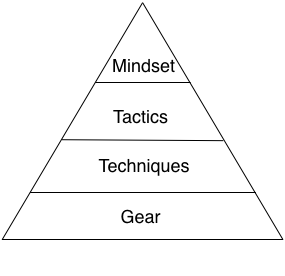 This is the modern combatives “tactical pyramid”. It shows the priority of attributes in a martial artist needed to win fights. Natural advantage aside, all of these aspects may be trained (or in the case of Kit, purchased with gold pieces). Understand that this triangle comes from a modern combatives source, where “kit” includes concealed guns and knives. Clearly if the weapons on one side were disproportionately better — say you were openly carrying a big gun and the other side wasn’t — you’d have a kit advantage that might trump technique. You’d still need the mindset to do harm, though. Another comment about modern combatives: the tactics for street defence involve never being in a risky situation in the first place. A lot of the focus in combatives I’ve attended is on hazard spotting or avoiding being surprised, knowing when to flee, etc. That context aside — I really like the triangle. It’s a good illustration of the priorities the instructor should have when training students. It’s gratifying. For the student who knows very little, being able to learn techniques piecemeal and execute them will give them positive feedback about the learning process. It’s easier for the instructor. Ideas like tactics and mindset are high-level, “soft” concepts. Techniques are well defined, “hard” procedures — as in if you do X correctly, the result will be Y. They are effective for base conditioning. Being able to execute basic moves shifts the student from a state of conscious to unconscious competence; in other words they have less cognitive load associated with executing moves, and so can develop higher level tactics. More about that in a minute. Those are all positives. There is one negative, which is cool technique is what Hollywood has taught us to expect. When we visualise ourselves fighting — either as martial artists or in RPG combat — we think about looking good. A lot of MA mastery is about getting over one’s own narcissism. Learning to drive is the example often used, although I’ve also seen it in corporate seminars — usually while trying to make the audience feel good about culture change or something similarly nebulous. If someone told you you’re going to actually get worse at the activity before you get better, would you even start? It should come as no surprise that the point at which the student becomes consciously incompetent is when they’re most likely to quit. Let’s say the student has attended classes for a few months. They’ve won a few fights, mainly on natural talent (agression, vigor, speed) rather than finesse. This is because while they’re great at doing the techniques in a controlled environment, it all goes out the window when their blood is up. Now say they’re a conscientious student — they want to believe in their new hobby and for them, winning doesn’t count without good form. Unfortunately putting the techniques into place is a cognitive load. While they’re thinking about doing the technique right they have less space for tactical reasoning, and… they start losing fights to less experienced students. This is the point where they start to have doubts — doubts about their own ability, and doubts about how well they fit into the school. Obviously this is where a coach comes in, to hold a mirror up and help the student realise that they are improving. 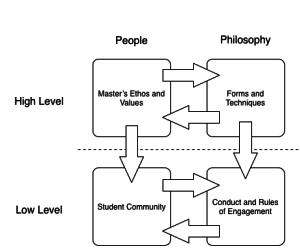 Ultimately whether the student remains in or leaves the school will come down to the school culture, of which the Instructor is a major element. When a new student comes to a school, they may well think they’re getting the same experience as they would in the school down the road. And for a lot of students who only ever study at one school they’ll probably never know the difference. However, martial arts schools don’t come from a mold — not even the ones that ascribe to an identifiable sub-form (say, Wado Ryu). The form has to be interpreted by the instructor and then passed on to her students. The History and Philosophy of the art will probably be the first thing that the student sees and what attracts her to the art. It will set an expectation in her mind for behaviours, her development, and the rules of engagement. 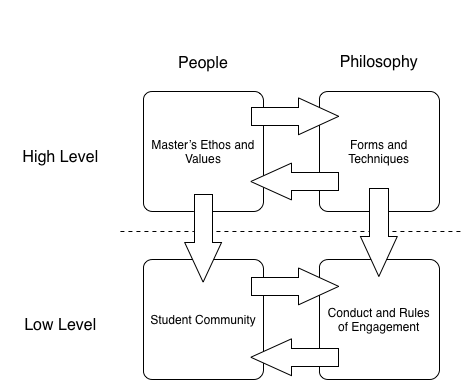 Instructor Ethos and Competence should reflect the philosophy of the art, but does it? This is all about the group leader — do they care about their students? Do they push and if so, how hard? Do they get results? How do their personal beliefs filter down to the school? Rules of Engagement are all about how students behave in the competitive environment, typified by how hard students will hit one another and still consider it “part of the game”. This will be directly influenced by the Instructor’s Ethos, and obviously affects how welcoming the school is to outsiders. The behaviour of Other Students will be influenced by the Rules of Engagement which will be set according to the Instructor’s Ethos. However knowing other students is sometimes a reason for a student to stay, even if she doesn’t like the rest of the school culture. Additionally the other students will be who the student is tested against — so it matters how the other students interpret the Rules of Engagement, how rough they are, and how sporting. While the school culture may be rooted in tradition, it’s really the Instructor who personifies that tradition and is the real source of the school’s identity. Instructors can have both a one-to-many relationship with the student body, and many one-to-one relationships with individual students. It’s the latter that the Instructor uses to coach and mentor individuals to reach their potential. At the same time the Instructor may convey expectations on the students through this relationship — including demands for loyalty. Martial Arts schools are tribal. That’s not intended to be pejorative, just a statement of fact. The fact that schools can have their own culture is an indicator of this. This means that when two schools come together they with interact positively or negatively based on the same cultural markers above. Furthermore the similarity of some aspects is no guarantee that the two tribes will get along, and differences don’t automatically mean disharmony either. At the high level the master will influence the form taught, and the form will influence the master. At the low level, the character of the student body will affect their conduct toward one another, and their conduct will affect character. Influence between high and low levels will be generally one-way, however. Now consider how another school might view this tribe. If the masters tend to agree then it may be because their views on form align. If they continue to agree with one another, they may end up influencing one another’s thoughts on form, training and technical art. On the contrary if they disagree, these are the areas where they will find fault with one another. At the student level the interactions will be predicated on training and competing with one another. If the students like each other they may be prepared to change the Rules of Engagement, even if this isn’t what they would normally do in the gym at home. If they dislike one another then the Rules of Engagement become contentious, with potential appeals to authority to tighten or relax those rules. This escalates tension from the student body into the domain of the masters. One of the aims of this series is to talk about Martial Arts in a RPG (and fiction) context. 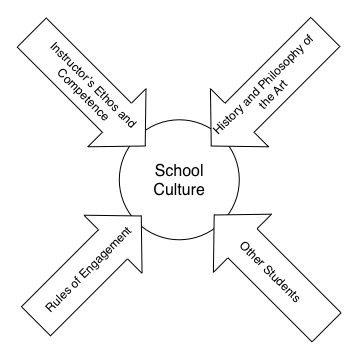 How does knowledge of school cultures help us? First, remember that a martial art isn’t just a skill, it involves practice and experience. While this is the case for all skills, practicing MA is unique in that gaining experience involves deliberate competition with others where the stakes are high: there’s the potential for injury in training, or even death. This coupled with the tribal nature of martial schools means a great potential for forming positive and negative relationships. The fact that those martial artists fight is possibly the least interesting thing about them. If you want to simulate martial arts in a game, forget the Fu powers of Feng Shui or the charms in Exalted, what about Strings from Monsterhearts or Hx from Apocalypse World? Now that you know that, consider the effect of emotion on the competitive arena. Judgement, Vigor and Calmness are the three pillars of Hope’s teachings, but Calmness is easily upset if there are bad feelings — I know firsthand the feeling of adrenaline that comes when facing down an opponent who you have a beef with outside the ring, and it’s not an advantage. What would happen in a fight if one combatant used a String on another? In summary, martial arts are cool, but the coolest thing about martial arts isn’t martial arts — it’s the dynamic relationship between master and student, between student and student, and between schools. Living tradition in martial arts has always been important, and the Western MA movement is often criticised for its lack of direct master-to-student lineage. Instead most WMA are based on masters from Eastern traditions picking up the manuals and interpreting the contents according to the ethos of their favoured school. This is why some WMA will look decidely like kenjutsu or modern sport sabre or theatrical stage fighting. But it’s not as much of a mess as it sounds; WMA is also practiced competitively and studied academically, and those conflicts will tease out inconsistencies and weak behaviours. The WMA instructor’s biggest problem is developing her own ethos in the absence of a mentor. Beyond that they are no different from their counterparts practicing popular eastern MA — and both need enough self belief and introspection to judge when the source they have learned from is not 100% correct.